5/24/10: Two More Vintage Quilts! 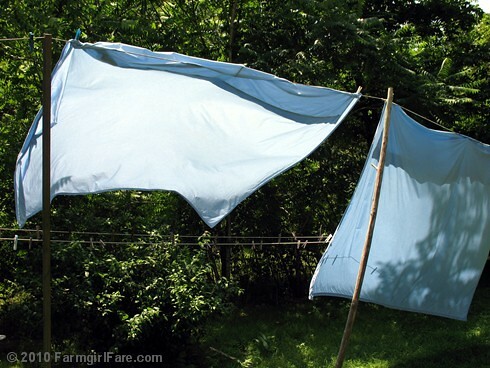 © 2010 FarmgirlFare.com, the fresh and clean foodie farm blog where sometimes if the breeze is just right, bedsheets on the line will billow in and out in such an even and peaceful way that they look as if they're breathing. I always stop and watch—and breathe. I also encourage stopping to slowly b r e a t h e. It is good for heart, lungs and soul. Hope you are doing well Susan - taking care of yourself and allowing healing. Love the photo of your sheets blowin' in the wind! Not much smells better than sheets dried on a clothes line and then put on a freshly-made bed!! MMmmm!! Unfortunately, we don't dry our sheets that way around here, but I remember it from when I was a kid. I am also a passionate hanger-out-of-laundry and also take photos of it! Our Canadaian climate doesn't allow me to indulge for too long but even in winter I will only use a dryer for emergencies. Of course laundry draped around the house isn't too pretty but I have installed a drying line in the basement. Miss that great fresh scent though. Watch out for those cottonmouths! What an ordeal! No snakes here - at least we can see the bears and wolves coming up here! I just caught up on all your news. You sure had a bad stretch there - I'm glad all are recovering. My condolences on your loss, though. Lovely. Hanging laundry is so chic, nowadays, but your poles are totally rustic. That outdoor clothesline looks great! I'm not able to put one up in the apartment I'm living in now, so I have one strung up across my shower. I keep hoping for the day I'll be able to have an outdoor clothesline once again!